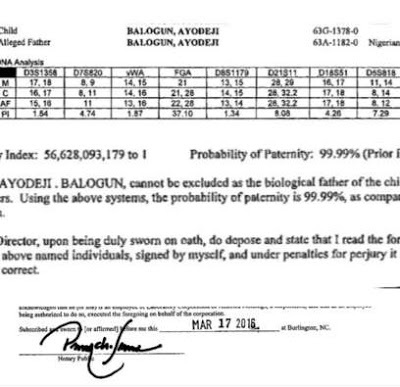 Seems like popular Nigerian singer, Wizkid is a dad for the second time if this latest DNA test is anything to go by. Recall that back in January a woman, Binta Diamond Diallo in the United States claimed Wizkid is the father of her son. Wizzy who already has a five year old son with ex-girlfriend, Oluwanishola did not respond to the reports but it seemed like he agreed to take a DNA test. The Guinean American model and Wizkid's second baby mama, Binta Diamond Diallo shared a DNA test on her Instagram page confirming Wizkid is the father of her son, who she named after him. "Read between the lines #DNADOESNTLIE #notjustarumor #facts,” she captioned the photo of the paternity test shared on her Instagram page yesterday, May 31, 2016.